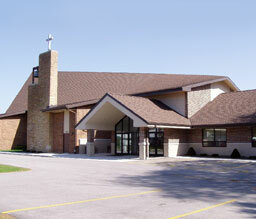 Welcome to the web site of Loving Shepherd Evangelical Lutheran Church. We hope that the time you spend browsing our site will give you more information about our congregation and answer some of the questions you may have. While our name is fairly new our roots in Milwaukee go back nearly 150 years. Check out our History for more details. As you browse our site you will see that we are a Bible-based, Christ-centered, Lutheran church. We believe and teach that the Bible is the inspired Word of God, is true in every respect and that faith in Jesus Christ is the only way to salvation. Please accept our invitation to stop in and visit us anytime. We would love to get to know you better and have you as a part of our family! If there is any way we can assist you, please do not hesitate to Contact Us. Sunday: 8:00 a.m. & 10:15 a.m. Behold the Lamb of God who takes away the sin of the world! Join us this holiest of weeks as we rejoice in God's gracious promises and find comfort in His perfect love. Christ has died! Christ is risen! Christ will come again! Easter Sunday @ 7:00 and 10:15 AM with breakfast in-between services.